Given the temperate climate we have been having in Texas throughout the winter, we haven’t made a lot of soups, stews or hardy meals. Although the months have flown by, the seasons have more or less remained the same, except we are not being brutalized by searing heat. As such, we are still eating light, crisp meals we would typically eat in the Spring, Fall and Summer. Today was ceviche. Baby makes a pretty mean ceviche. 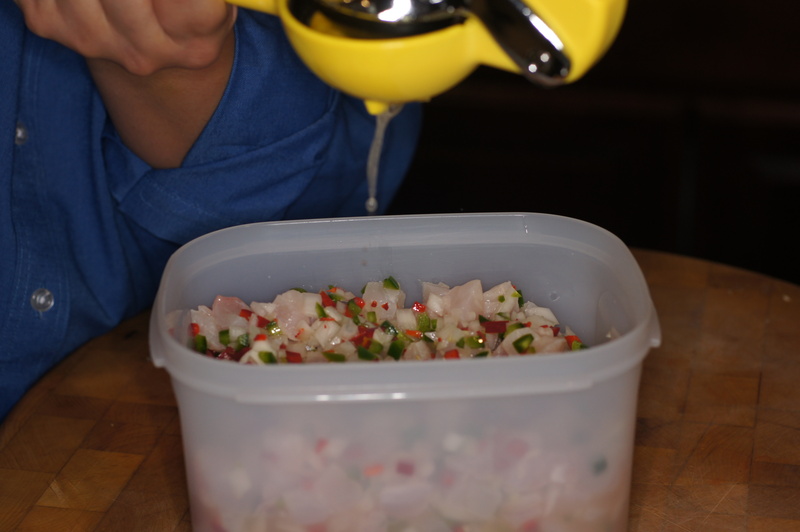 Ceviche is a fascinating food. It’s cooked but not in the traditional sense and it’s raw but not really as the citric acid cooks the flesh. It has its origins in South America, most likely Peru. Nonetheless, it is popular throughout Latin America and coastal regions of Florida, Texas & California where there is a strong Latino presence and influence. 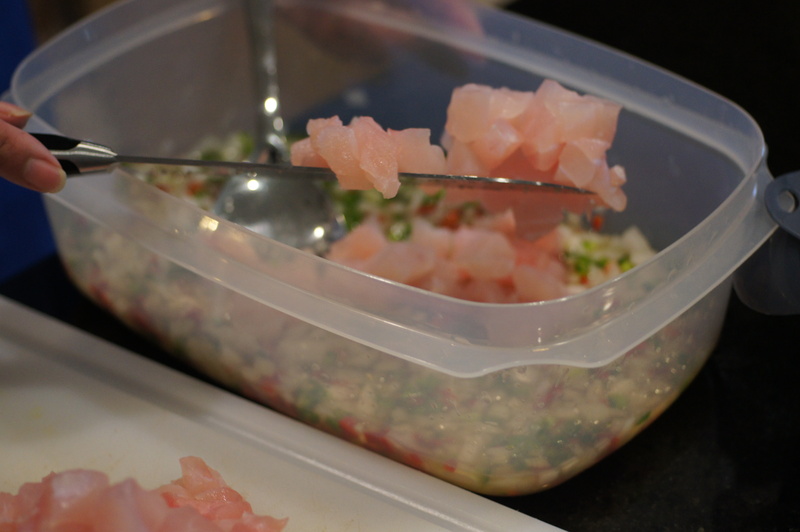 It’s popularity is increasing as witnessed by the development of cevicherias around the world. One in particular, La Mar Cebicheria, at which we ate in our travels to Santiago, Chile is very upscale and has locations in New York City, San Francisco, Lima, Peru, Bogota, Columbia, Sao Paulo, Brazil, Panama City, Panama, and Mexico, DF. The classic Peruvian ceviche is composed of chunks of raw fish, marinated in freshly squeezed key lime or bitter orange (naranja agria) juice, with sliced onions, chile, salt and pepper. Corvina or Cebo (sea bass) was the fish traditionally used. The mixture was traditionally marinated for several hours and served at room temperature with chunks of corn-on-the-cob, and slices of cooked sweet potato. In El Salvador, one of the most exotic ceviche recipes is “Ceviche de Concha Negra” known in Mexico as Pata de Mula “the Black Clam.” It is dark, almost black, with a distinct look and flavor. 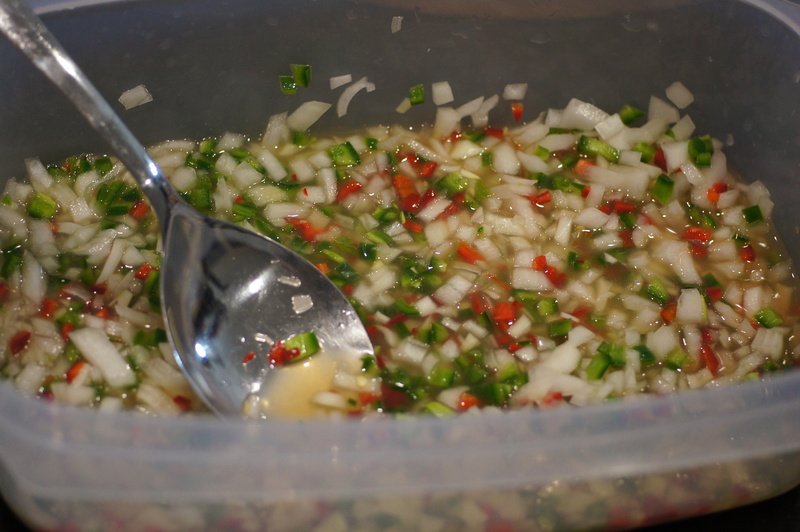 The ceviche is prepared with Lime juice, onion, yerba buena, salt, pepper,tomato, Worcester sauce, and sometimes picante. 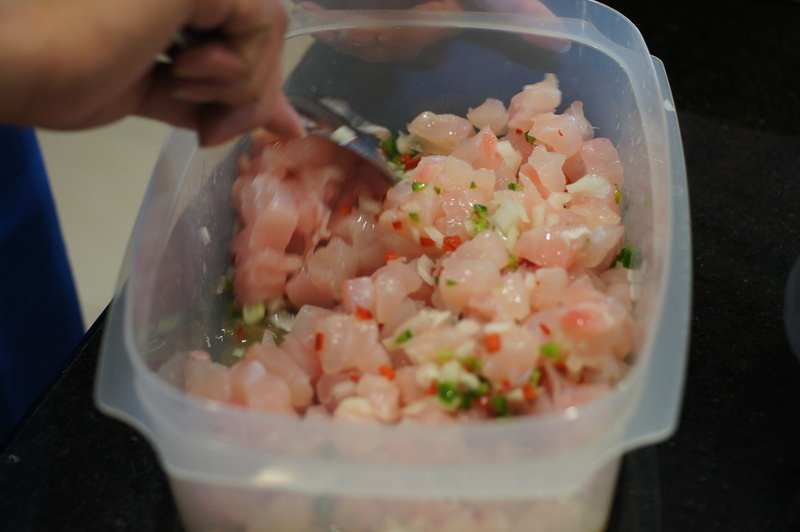 Ceviche is not a native Mexican dish but was imported from South and Central America. Nonetheless, it has been a part of Mexican cooking for centuries. In various parts of Mexico, ceviche is served in cocktail cups with tostadas, or as a tostada topping and taco filling. 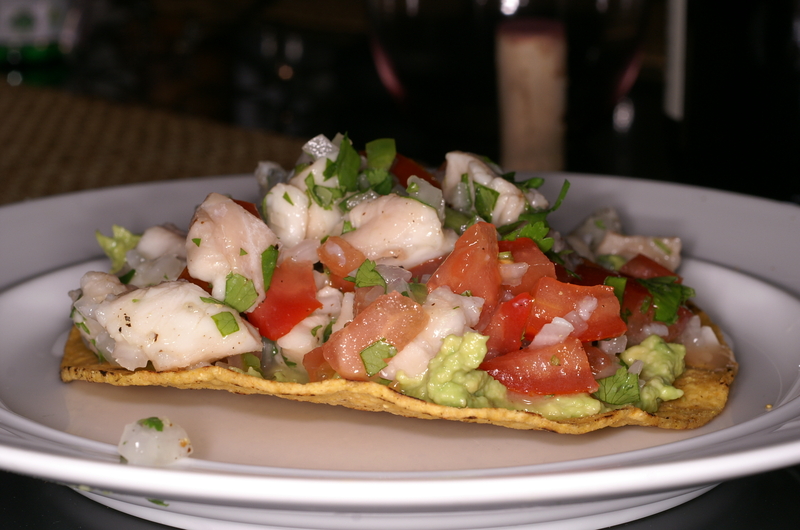 Shrimp, octopus, squid, tuna, and mackerel are popular bases for Mexican ceviche. The marinade ingredients include salt, lime, onion, chile, avocado, and cilantro. Often tomatoes are added to the mix. Being from El Paso, Baby’s ceviche is more Mexican in nature. One thing is certain, it sure is good! Dice the onion and jalapeños and place in container along with the juice of the limes. Add the cubed grouper to the jalapeño, onion and lime mix. Add salt and toss to incorporate. 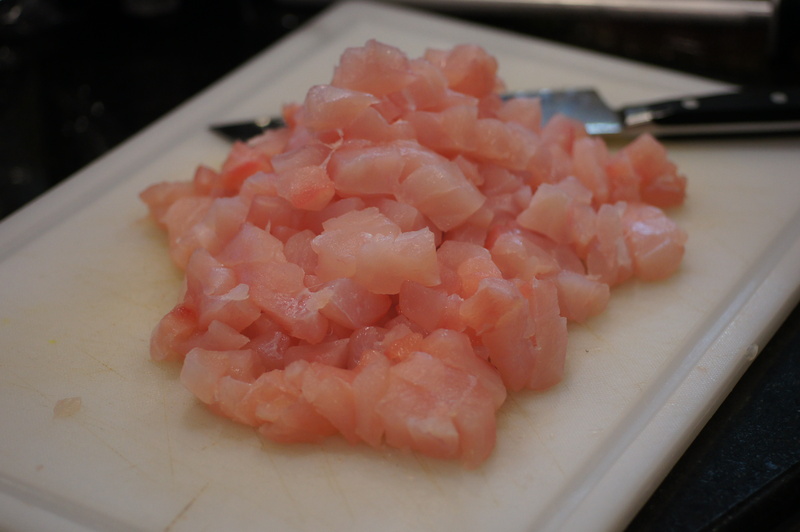 If necessary, add more lime juice to cover the cubed grouper. Cover the container and place in refrigerator overnight. Remove from refrigerator the following day and adjust salt. 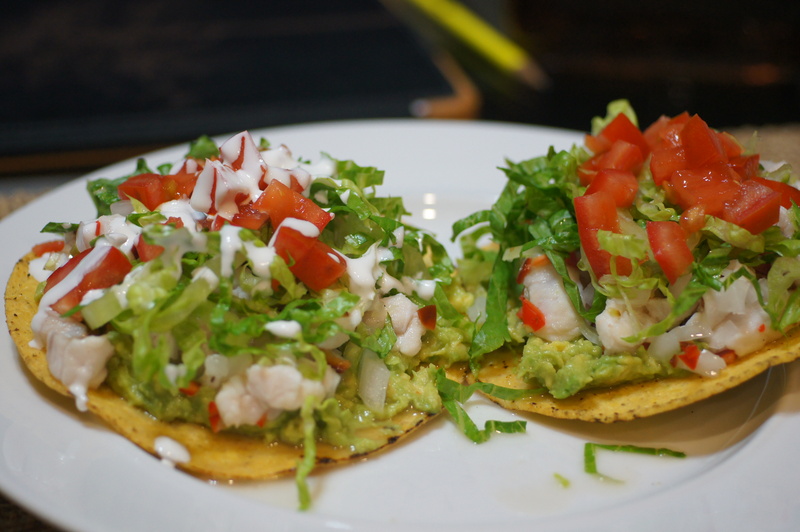 To serve, spread guacamole on a corn tostada, put ceviche on top of guacamole, sprinkle with chopped cilantro, add shredded lettuce, tomatoes and Mexican Crema (Mexican Creme Fraise). Enjoy. Alternatively, spread guacamole on corn tostada, add ceviche, cilantro, and tomatoes. Delicioso!